What Is the Salt Creek Watershed? The management of wastewater is among one of the murkier topics when it comes to public awareness of the greater environment. Waste- and stormwater management account for some of the largest impacts on a community’s livelihood and sustainability, but the facts behind wastewater management practices are typically flushed away from public consciousness. Large-scale infrastructure such as the John Egan and Hanover treatment plants in the Schaumburg area encourage public ignorance and unsustainable practices by applying one-size-fits-all prescriptions that operate beyond the neighborhood scale. Within the current arrangement, however, exists an opportunity for waste- and stormwater management practices to be implemented on a micro-scale that moves away from the conventional energy-intensive system that emphasizes isolation of waste, collection and treatment of water, and finally, redistribution. Considering that the manner in which water is collected and treated indicates the long-term health and viability of a given place, effective waste- and stormwater management has to become a tangible feature of everyday life. Although Schaumburg’s record of keeping separate treatment facilities for waste- and stormwater, respectively, is an innovative approach to maintaining a clean water system, it places an attendant demand on tapping Lake Michigan for its drinking water. Such a reliance on Lake Michigan is in effect a water tax, with residents paying increasing costs to simply obtain their water, especially in comparison to other, surrounding communities. The Egan and Hanover plants are indeed effective at what they do, but the costly expenditures in maintaining such a centralized, industrial process seems to take the tone of waging “war” against sewage and storm runoff. Massive water treatment plants also lead to the eventual degradation of the landscape by promoting destructive development practices that do not take into account any specificity or nuance of the surrounding landscape. The end result has been an approach that promotes connecting specific sites to a larger treatment plant, as opposed to being watershed-specific. This approach encourages sprawl by not looking at wetland and watershed capacity contextually; it simply is based upon connecting and extending out industrial-minded infrastructure to connect plant to site, with an attendant result of the spread of impervious surface area. In an article entitled “Dense and Beautiful Stormwater Management,” author Laurence Auerbach notes how the rise of impervious surfaces increases the need for water treatment. “On developed land with paved and built surfaces, the water doesn’t soak into the ground as much. Instead, it flows over the surface,” he notes. “Flowing water from precipitation (known as ‘runoff’) must be handled properly; otherwise it will cause flooding and erosion, and will pollute and damage streams, lakes, and rivers.” Yet, standardized applications that are conventionally in place to treat water strain the watershed capacity. An approach that looks at the capacity of the natural watershed to support certain settlement patterns could be incorporated to capture runoff, reduce demand of industrialized water applications, and influence constituents to reduce use by providing daily feedback in how the local water cycle works. Small-scale, incremental infrastructure that places wastewater in context to its immediate surroundings is one of the more effective methods of treating water directly at the site. Town planner Steven Coyle articulates such a system in his how-to manual Sustainable and Resilient Communities. 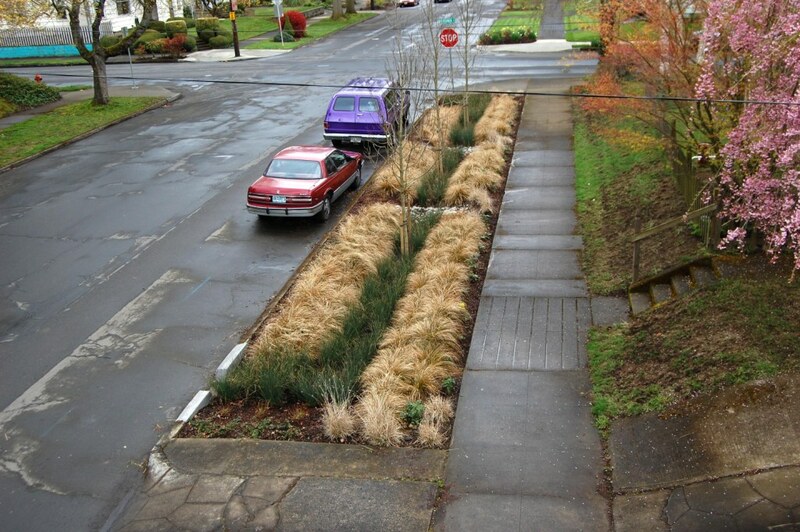 Coyle advocates for “decentralized applications” such as bioswales that capture rainwater directly at the site and act as mini-wetlands within a neighborhood context. Writing in the book Sustainable Urbanism, Thomas Ennis argues that by increasing the amount of on-site water treatment solutions such as bioswales or rainwater barrels, neighborhood residents receive direct, tangible feedback on water usage and maintenance, and in turn, develop a more sustainable stewardship over water use and management practices. Increasingly, this local-level approach is catching on, with localities expressing an interest in investing in the type of local, green infrastructure as advocated by Coyle and Ennis above. This is done on the community level, often at the neighborhood and down to the block scale. Such approaches are in sync with “new urbanist” thought that allows for water to be treated within the capacity of the greater community, and to be used and utilized as an asset, not simply something that is shipped off. It is a paradigm shift that changes the emphasis on wastewater from a waste product in need of remediation to a resource that can be harnessed and reused to greater purpose. For an edge city like Schaumburg, IL — in many ways a poster child of unchecked suburban sprawl and impervious surface design — the failure to adopt context-sensitive practices that protect its watershed will end up having dire consequences for the surrounding area. Despite Schaumburg’s innovations in treatment, moving away from waste- and stormwater management practices that regard water as something to be disposed of will increase public awareness and participation in wastewater management practices, limit municipal costs, and provide for easier maintenance of the watershed. These actions are aligned with — and in fact, exceed — the goals expressed in the Village of Schaumburg’s “Comprehensive Green Action Plan.” Now is the time for Schaumburg to implement more efficient, community-specific, urban-minded reform practices that will lead to better outcomes for the environment, the public, and the pocketbook.